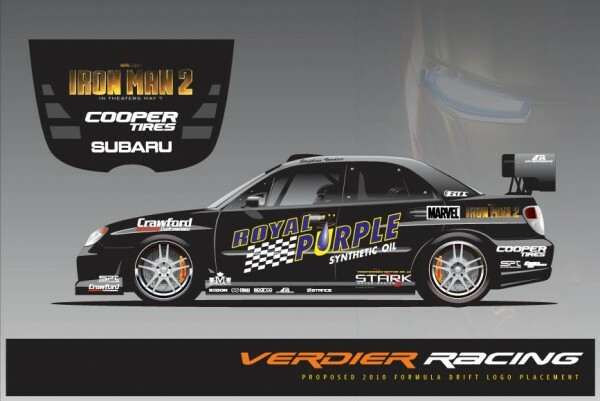 Stephan Verdier Racing is pleased to announce our new and returning sponsors for the 2010 Formula D Seasons, a sneak preview at our partnership with the upcoming movie Iron Man 2, our new partner Royal Purple and plans for more power! For the first two rounds of the Formula D Season we will have our new partnership agreement with Iron Man 2. One team was selected in each of the five different motorsports disciplines to represent the Stark Racing Team from the upcoming movie Iron Man 2 and we were selected for the drifting aspect of those disciplines. The car will sport a new livery for the first two rounds of the Formula D series with the Iron Man 2/ Royal Purple colors. Upon completion of the first two rounds the livery will be changed for the remainder of the year. Crawford Performance has also agreed to step up there involvement in the Formula D racing program by building a brand new engine/power package and supplying a sequential gear box for the season. “There will be quite a bit more power on tap for Stephan this year to keep the edge on the competition in his race for the 2010 Championship and we wish him the best for the upcoming season!”, says Quirt Crawford, President of Crawford Performance. In conjunction with the returning sponsors, Cooper tire, Clutch Masters, Subaru, Enkei, I-speed, Turbo by Garrett, RMR, Stance, Sparco, Seibon, Apr, Gti we now know we have an optimal chance at the championship this year we can not wait for round 1 at Long Beach to get started!